Take 45 North, Exit 336, Take a left on 336, Take a right at Longmire Road, Landings at Conroe is on your right. Please call our leasing office for driving directions. 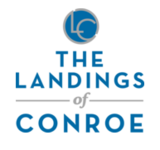 For a peaceful life with a lot of space—and shopping and attractions nearby—don’t miss The Landings of Conroe, a comfortable community of apartments in the Woodlands-Conroe area. Within a mile of home, you’ll find plenty of places to shop and eat. Experience the best of hearty Texas cuisine at Texas Roadhouse, home of ribs, hand-cut steaks and, of course, chicken fried steak. Likewise, you can’t go wrong at MOD Pizza. To eat at home, groceries from Kroger and ALDI are just moments away. Conroe is the seat of Montgomery County, TX, lying at the northern edge of the Houston metropolitan area and providing an easy Interstate 45 commute to its major economic centers. The Landings of Conroe gives residents that hard-to-find balance of quiet community, just-right neighborhood and quick access to a major city with a powerhouse economy.